What if a prominent maker of competitively priced, quality firearms proposed a pistol that was no-holds-barred? You don’t have to hold your breath in anticipation of waiting to see this premium firearm, because it already exists. 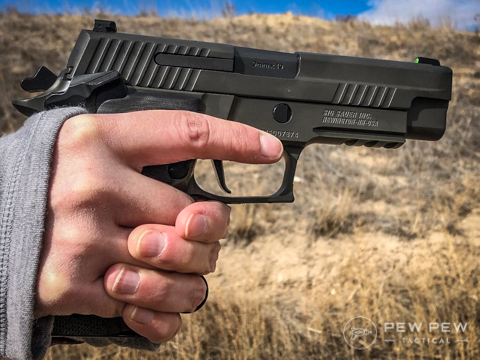 I’ll warn you up front, the cost of admission to this ride is high, but the Sig Sauer Legion is one of the finest pistols I’ve ever held in my hands and I am here to tell you why. 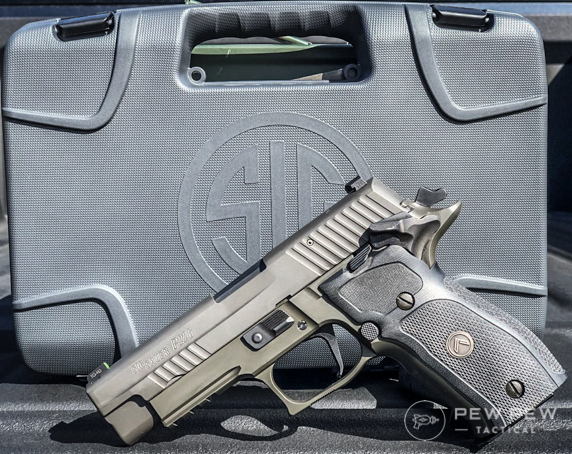 Having recently completed a review of the Sig M17 I set my sights on the next shooter the esteemed firearms manufacturer provided for testing—the Legion P226 SAO. In essence, this means it is a full-sized, semi-automatic, chambered in 9mm. Now, I’m primarily a striker-fired kind of guy and I carry a pistol professionally. I like things simplified so I requested this version specifically from Sig. When I spent some time considering what I might be going through for testing, I did not want the addition of a hammer AND a de-cocker, AND an external safety. I wanted the gun to be as close to my normal operating parameters as possible (i.e. my comfort zone). Having the M17 and the Legion together gave me some great perspective on what Sig is selling you with each offering. In the M17 you get the government model without too much fluff, though I argued this gun is a great deal better than what G-employees are typically used to. Regardless, it’s basic, to say the least. With the Legion, you get more! The box is bigger and nicer. There is more branding in a pseudo-Roman/Spartan theme with a single stylized chevron, and you also get three magazines as opposed to the M17’s two. That’s good enough soldier, now get back out there! This box is more than you’re used to, doubled hasps, lockable, and plenty of room for this modern equivalent to the Kopis! Also inside the box, you find literature welcoming you into an elite club, Legion. 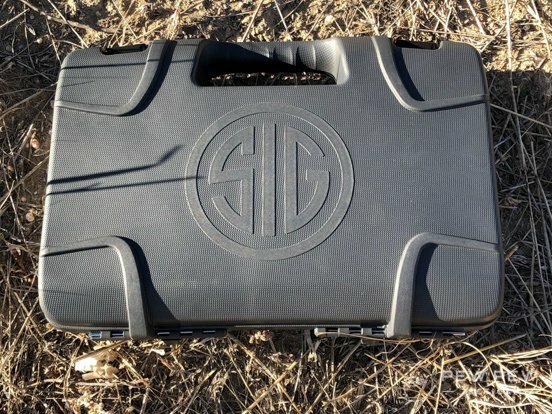 By calling the special number, you can get a free thermo-molded gun case as well as a challenge coin to show the polymer crowd you belong to something better. The brochure also promises free gear, exclusive access, and select communications. I can’t review this portion as of the writing, but I’m letting you know it’s an option. I am a skeptic by nature and I’d rather hold an ounce of gold in my hands than ten pounds of promises. And ladies and gentlemen, this is where things changed for me—discarding all the literature, stickers, and other accouterments, I simply placed my hand on the gun. Pulling it from the case, I noticed music began to play from some magical source. The heavily textured G-10 grips grabbed my palm, my fingers felt the checkered front strap, and the web of my thumb felt the confident presence of a superior beavertail. Holding this thing, this marvelous creation in my hands, my support hand closed on it lest someone wrest it from me as Gollum lost the one true ring. The lack of corners, the presence of effortless grip, was thrilling. Surely, when I was molded in the Matrix, somewhere this gun was created as the perfect fit for my enormous hands. Ahh but the cynic arose again to the forefront of my mind, beating back the stringed quartet who’d set up shop there. Sure, it feels amazing, but how does it shoot? The bore axis was a little higher than I am used to so I began to hedge my bet yet again, not as convinced things were going to be that great. Plus the weight of the Legion is slightly heavier than my normal carry, coming in empty at 2 pounds 1.9 ounces. The music died away and I resolved to see the proof in the pudding, not convinced the austere green/grey color scheme of the Legion would lend it any performance benefit. Over the course of a few months and three separate trips to the range, I had the opportunity to put 700 rounds through the Legion. I used the ammo Sig was kind enough to send along, the Elite Performance as well as their V-Crown, which all ran extremely well. I also used some random stuff I had laying around, Winchester white box, some steel cased stuff, Black Hills, and some American Eagle. No matter what I shot, the Sig spit it out predictably on target. The ergo of this grip is more about the shape and less about the size, filling gaps even for smaller hands. Also, note the daytime brightness of the front sight, very easy for the eye to pick up. And speaking of “on target”, I began to marvel at the excellent accuracy I experienced with the Legion. In studying the matter over several testings, I believe it is a combination of multiple factors blending together to make this weapon superior in many ways. The gun just fit my hands like it was made for them. The grips were superbly textured, it felt like the symbiote Venom was trying to bond with me. On top of this, the beaver tail was extended, to the point that it covered the web of my thumb extremely well—making my ability to soak recoil supreme. My wife’s much smaller hands even enjoyed the contours of the grip. She said it felt like there were fewer gaps in her grip. She’s right, I experienced the same. This trigger is simply butter. The Lyman Digital Gauge from Brownells averaged the pull at 3 pounds 8.6 ounces. There is a couple of millimeters of slack or take up before you feel resistance, enough to get on. Then, pulling through seals the deal with a clean break. Trigger reset is ridiculous! Simply letting off pressure resets the Legion for action. I am being completely serious when I tell you it is little more than the movement of a mouse button. I wondered aloud at this until I remembered it is a hammer-fired handgun. With controlling recoil totally managed, the sights were the last critical component. The X-RAY3 day/night sights were superb. My eye easily tracked the Hulk green front sight prior to and after the gun fired. As soon as I was right back on, I fired again, the short trigger reset allowing for some rapid fire. The results were outstanding. Trying the same in the darkness found the sights handle both settings with aplomb. An entire magazine of 15 rounds from 21 feet in quick succession. You can see I pulled one. The combined package improved my shooting. 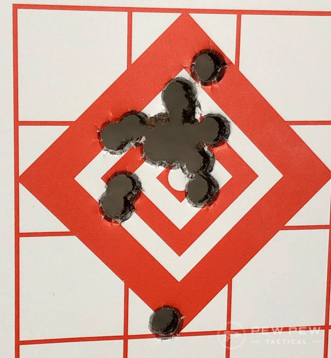 I set out from a distance of ten feet from the target and determined to run two full magazines through on the same spot of the target. The idea of the drill is getting used to the gun and seeing how and where it shoots. First magazine was a decent rate of fire and the second, more aggressive. Granted, I was close, but the idea of thirty rounds going through the same ragged hole had me impressed—especially at speed. I liked all the controls but found the slide release to be a bit of a tight fit, slightly crowded by the safety. I’m sure when I get more used to the Legion I’ll adjust to it. I am not a fan of an external safety, but this one is well placed and easy to deactivate. In fact, when shooting, my thumb rests neatly on top of the safety. As mentioned above, I ran several brands of ammo through this gun over the course of a few trips to the range. I never experienced any failures or malfunctions. I did fail to properly seat the magazine at one point leading to that sickening “click” when I pulled the trigger. An immediate action drill cured this and I was soon banging away, operator error noted. I cannot praise the Legion enough for its ergonomics. With one slight gripe being the crowded slide release, the rest is an absolute dream. The swell of the backstrap fits my hand to a T, and the aggressive texturing makes sure it stays in place. I do wonder if it might eventually wear down a long sleeve shirt with too much contact though. Of course, I can always buy more shirts. The combination of controllability, amazing trigger, and superlative sights makes this full-sized pistol an absolute laser. I was laughing as I shot the same hole (or extremely close to it) multiple times. The same predictability difficult to replicate in a striker-fired weapon where the long trigger pull often leads to a rushed shot and low left hits on target. The Legion does not suffer this. The Legion is already customized. There is a common theme in the firearms industry of people buying guns then spending a lot more money adding this particular doodad or that in an effort to make it perfect. The Legion was designed to satisfy people who want to buy an awesome pistol, just like it is. I suspect you could change the sights though I don’t know why you would. You can also add a light though keep in mind this is a Sig rail. Everything else is golden because it has already been upgraded. Accessing the exclusive offerings of the Legion membership, who knows what may be available? This will possibly have some people scratching their heads but others will see what I’m driving at. If you aren’t into building up a firearm with all the best parts from your favorite companies—imagine the ultimate Frankengun—but want hellacious performance, indomitable accuracy and reliability, buy the Legion. Perfect if you subscribe to the philosophy of “Buy once, cry once” with Sig’s MSRP around $1,400.00. Thankfully, street price is a touch lower. That said, they can be found around $,1,100.00 online and you are absolutely getting what you pay for. I’ve purchased expensive handguns before thinking they were the ultimate, but they later fell short. Imagine a handgun with startling good accuracy, but malfunctions regularly with some ammo brands. The Legion is not that gun. This is an expensive firearm but it delivers extremely impressive performance in all categories. 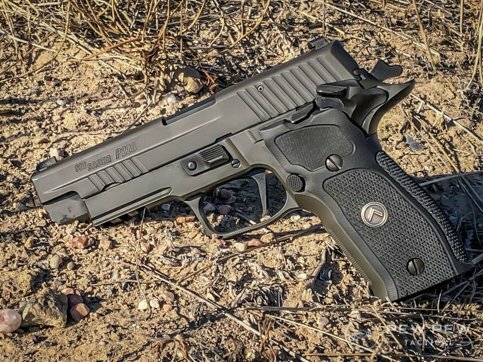 The Legion from Sig is a shining example of what a firearm manufacturer can do when they set out to build an amazing handgun with no limitations. Many people will balk at the price but the capabilities of the pistol are overtly worth the price tag. I would hazard to say this gun can make people better shooters, simply by picking it up and firing it. Are you part of the Legion? Have another high-end pistol you love? Tell us about it in the comments! If you’re ready to take your pistol to the next level, check out the 4 Best Pistol Red Dot Sights! I have this Legion and absolutely love it! I hardly have to aim just point and press. Well worth the money. How does the Sig compare to the new Walther Q5 Match? David, this is an excellent question–I have heard some stellar things about the Q5 Match, I might just have to review that one. Please do review the Q5 match sf!!! I purchased one last year. Nothing can beat it. End of story.